Jesuism, also called Jesusism or Jesuanism, is the philosophy or teachings of Jesus of Nazareth and the adherence to them. Jesuism considers Jesus as the supreme authority of Christianity. Within Jesuism, one seeks to restore Jesus' sayings to their original purity. This includes eradicating human interpolations of the Gospels and misconceptions revealed by recent archaeological research. Jesuism is distinct from and sometimes opposed to mainstream directions. In particular, the term is often contrasted with the theology attributed to Paul of Tarsus and mainstream church dogma. Whilst not being opposed to the Christian Bible or Church doctrine, Jesuism does not affirm their authority over the teachings of Jesus. As a philosophy, Owen Flanagan characterized Jesuism as naturalistic and rationalist, rejecting the conflict between faith and science. Though not specifically associated with Jesuism, the red letter Bibles are one method of studying the teachings of Jesus. Another is the Jefferson Bible. Many New Testament scholars have tried to identify Jesus' authentic sayings and actions; Géza Vermes, in particular, in his The Authentic Gospel of Jesus identifies what elements of the synoptic gospels are attributable to Jesus. The term "Jesuism" was coined by the late 1800s. It is derived from "Jesus" (Jesus of Nazareth) + "-ism" (English suffix, a characteristic or system of beliefs, from French -isme, Latin -ismus, Greek -ismos). 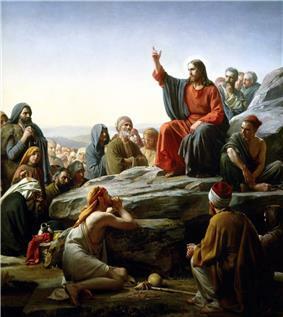 Carl Heinrich Bloch's rendition of Jesus' Sermon on the Mount, which is central to the philosophy of Jesusism. It is to restore Jesus' sayings to their original purity. It is to eradicate from the Gospels the interpolations of the Middle Ages. It is to relate the misconceptions revealed by recent archaeological research. It is to present Jesus from an economic viewpoint. It is to break through the spell spectral of Cosmic Credulity. It is to toll the knell of schism through Jesusism. The Orthodox theologian Sergei Bulgakov further noted in 1935 that "the concentration of piety on the Christ alone has become a deviation already known by a special term as Jesusism". Influential Catholic theologian Karl Rahner referred to "Jesusism" as a focus on the life of Jesus and attempts to imitate his life, as opposed to a focus on God or the Christian Church. University of Melbourne professor Lindsay Falvey noted in 2009 that "the gospel story so differs from Church doctrine that it could well be of a different religion – Jesusism". Jesusism became the subject of increased academic discussion following its reference by Duke University neurobiologist and philosopher Owen Flanagan in his 2007 book The Really Hard Problem: Meaning in a Material World. Flanagan defines Jesusism as the "message" of Jesus and notes that he "call[s] it ‘Jesusism’ because most Christian Churches do not endorse Jesus’ message truthfully". Rodney Stenning Edgecombe, a professor at the University of Cape Town, in a 2009 essay titled Communication Across the Social Divide remarks how Christianity shifted away from Jesuism; the moral tenets Jesus preached. The terms Jesuism, Jesusism and Jesuanism are also referenced popularly on religious blogs and internet groups. There is no definitive meaning of Jesuism, Jesusism or Jesuanism, and hence no clear ideology. However, Frank Seaver Billings described "Jesusism" as a combination of anarchism and communism (see anarchist communism and Christian anarchism). Billings, an American atheist and materialist, was critical of all religion, including Jesuism. Various groups use the terms Jesuism, Jesusism and Jesuanism. These include disenchanted institutional religion or Pauline Christianity, people who identify themselves as disciples of Jesus rather than Christians, Christian atheists who accept Jesus' teachings but do not believe in God, and atheists who are critical of all religion including Jesuism. Adherents may be termed Jesuists, Jesusists or Jesuans. Due to its fundamental disposition towards theological revelation, some publishers have drawn comparisons between Jesuists and Muwahhid Muslims. Jesuism does not affirm the spiritual or scriptural authority of the Christian Bible (with the exception of the Gospels). Jesuism is particularly contrasted with Pauline Christianity or Paulinism, the theology of Paul of Tarsus. The spring which flows quietly and transparently through the Gospels seems to have foam on it in Paul’s Epistles. Or, that is how it seems to me. Perhaps it is just my own impurity which sees cloudiness in it; for why shouldn’t this impurity be able to pollute what is clear? But to me it’s as if I saw human passion here, something like pride or anger, which does not agree with the humility of the Gospels. As if there were here an emphasis on his own person, and even as a religious act, which is foreign to the Gospel. In the Gospels – so it seems to me – everything is less pretentious, humbler, simpler. There are huts; with Paul a church. There all men are equal and God himself is a man; with Paul there is already something like a hierarchy; honours and offices. ^ a b Bouck White. The Call of the Carpenter. USA: Doubleday, Page & Company, 1911. p.314. ^ Edgar Dewitt Jones. Paul the Stranger. Abilene: Voice of Jesus, 2003 (online transcription). ^ "Modern Christianity Not Jesusism." Signs of the Times Vol. 24 No. 25. Melbourne: Signs Publishing Company Limited, June 21, 1909. ^ Mark R. Alfino. "Spring 2010 Senior Seminar Note 7.3.1. Jesusism?" Spokane: Gonzaga University, 2010. ^ "Paulinism." Random House Dictionary. Random House, 2011.